When is it not safe to use Betnovate? Betnovate is a topical corticosteroid that is applied directly to the skin. It contains the active ingredient, betamethasone valerate, which is a cortisone. Betnovate works by suppressing the inflammatory reaction during use. It is used as an effective treatment for many skin conditions, such as psoriasis and eczema that have failed to respond to milder treatments. Betnovate is also used to treat haemorrhoids. It is important to note that Betnovate suppresses the symptoms of certain conditions, but is not a curative and the symptoms may return after discontinuation. Betnovate is not suitable for long-term use. 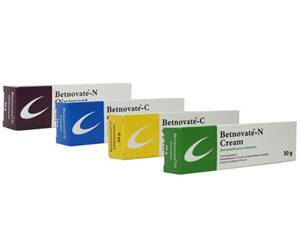 Betnovate is available on prescription for adults and children over the age of one in the form of a cream or an ointment. As a general rule, the cream is more suitable for treating wet skin conditions, while the ointment is better at treating dry, flaky skin. Wash and dry your hands before applying the cream or ointment. Carefully squeeze a small amount into your hands and gently rub it into the affected area of skin. Wash and dry your hands after applying the product unless the hands themselves are the area being treated. Be careful not to get the cream in your eyes, nose or mouth. If you do, promptly rinse with cold water. Betnovate should not be applied to areas of broken or weeping skin. Follow the instructions provided by your doctor. If you forget to use it, apply it as soon as you remember and then resume your normal schedule of application. Regular use of Betnovate in the same area can thin the skin, making more vulnerable to damage. Tell your pharmacist or doctor if you notice any of the above. Cease using Betnovate and seek medical advice if you notice any of these effects. A feeling of tightness in the chest. If you think you may be having an allergic reaction to Betnovate, go to the Accident and Emergency Department of your nearest hospital immediately. Betnovate is a prescription medication and should not be used by anyone without the recommendation of their doctor. Some medications interact with Betnovate so it is important that you tell your doctor about any medications that you may be taking. If you become pregnant whilst using Betnovate, tell your doctor. Betnovate is not suitable for children unless prescribed by a doctor. Prolonged usage can affect a child's growth. For more information and advice about Betnovate, contact Dokteronline.com.